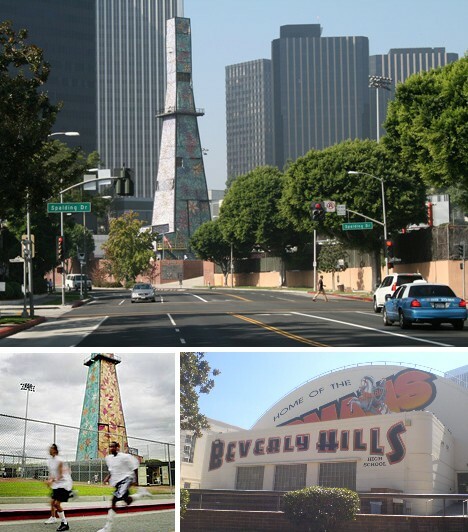 Beverly Hills High School is keeping a big secret – “big” as in 150 feet tall – on its neatly manicured grounds in zip code 90212. 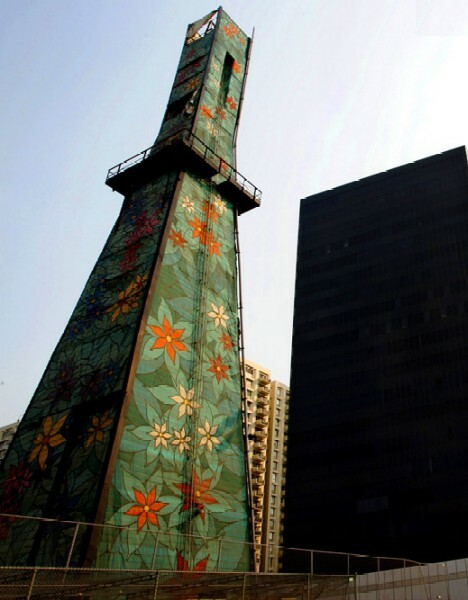 What appears to be a miniature version of Paris’ Eiffel Tower covered in graffiti by 1960s Flower Children cleverly disguises dirty, rugged oil drilling machinery that works day & night to bring the Earth’s inner riches to the surface. 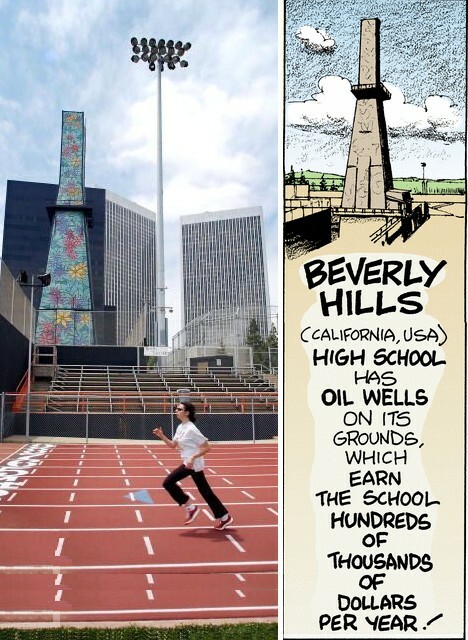 Beverly Hills High School, the only large high school in this affluent enclave of Los Angeles, has had a long and profitable relationship with Big Oil – indeed, the school receives approximately $300,000 a year (some sources say $700,000) in royalties courtesy of the hundreds of barrels of crude oil and 350,000 cubic feet of natural gas extracted from beneath the stylish campus every day. The oil lease royalties provide BHHS with a majority of its annual funding requirements and cover about 85% of teacher salaries, yet many (if not most) of the students are unaware that the neatly disguised source of those funds looms over the school in plain sight. 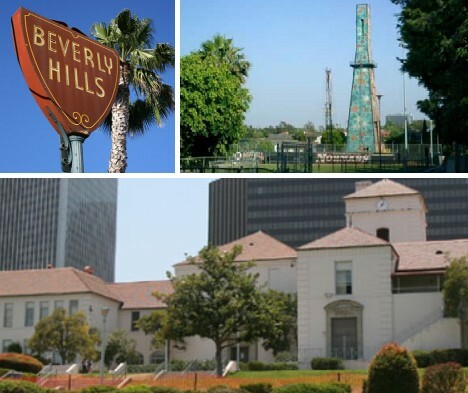 The Beverly Hills Oil Field was discovered in 1900. 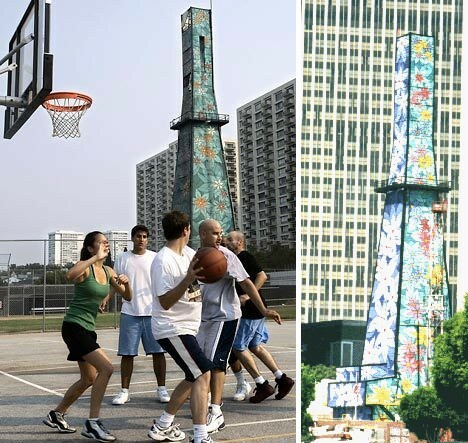 Over a century later, 97 active wells tap into California’s 39th largest oil field from four camouflaged and sound-insulated “drilling islands”, not to be confused with the four THUMS artificial islands (above) designed by Disney and constructed in Long Beach Harbor in the mid-1960s. 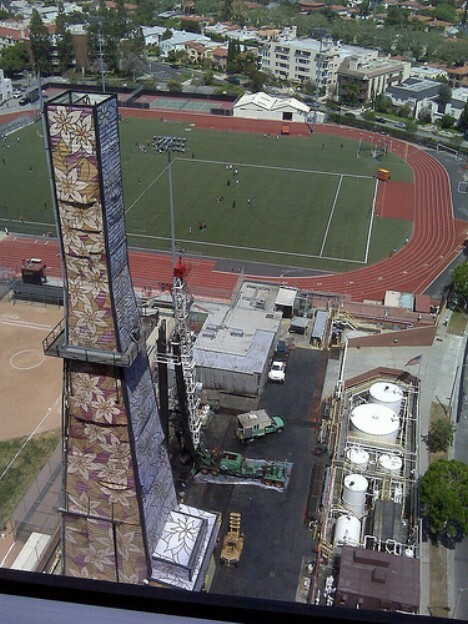 A dozen & a half wells and their accompanying infrastructure belonging to Venoco inc. are clustered just adjacent to the Beverly Hills High School (BHHS) athletic field, with the most prominent aspect being a 165-ft tall derrick dating back to a time long before urban oil exploration was forbidden to be conducted on California public school property. 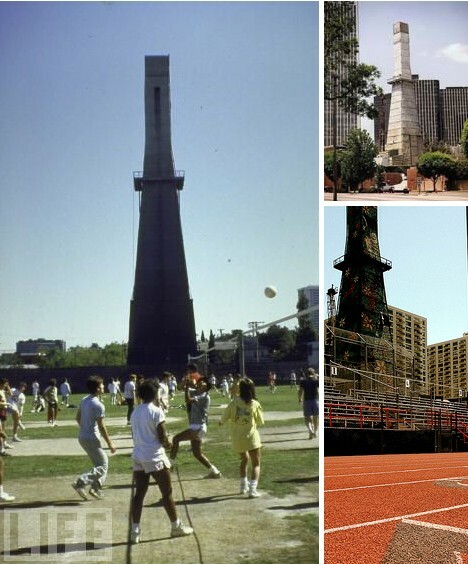 The history of the Beverly Hills High School oil well is long and rather convoluted. The present owner, Venoco Inc., bought the 0.6 acre parcel of land (and the mineral rights beneath it) in 1995 from Wainoco Oil & Gas Co., a subsidiary of Frontier Oil Corp., who had owned the land and drilling rights since 1985. 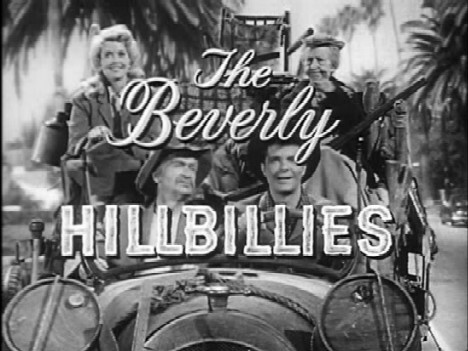 Even at that time drilling in Beverly Hills was old hat, having been practiced since the Roaring Twenties. Uncle Jed wasn’t the only oil millionaire living it up in Beverly Hills! 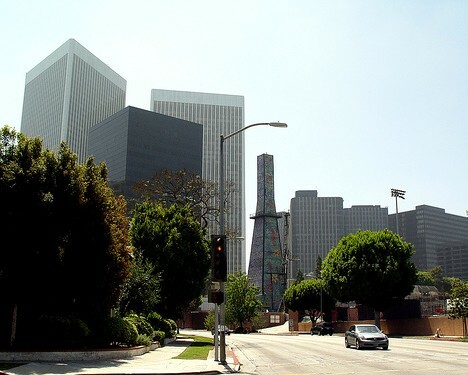 The rapid post-war expansion of Los Angeles and the encroachment of urban & residential neighborhoods demanded that the oil infrastructure adapt to the needs of society, something various oil companies have accomplished in some very innovative ways. BHHS itself dates from 1927 and most of its original buildings are still used on a daily basis. The school was designed to emulate the architectural style of medieval Normandy though the so-called “Swim Gym” dates from the late 1930s. 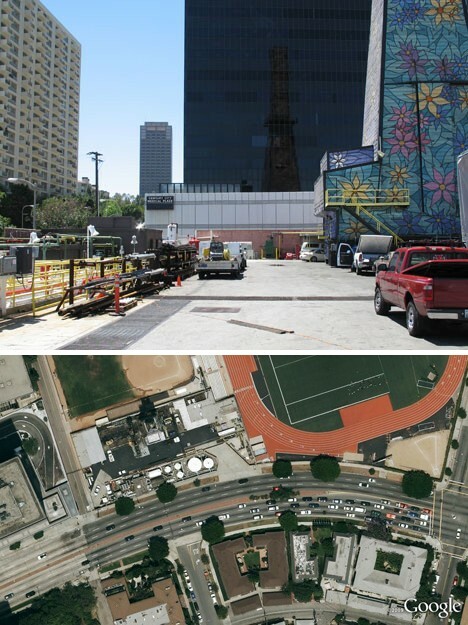 The outdoor athletics field and track & field area runs up against Olympic Boulevard with Venoco’s covered derrick and machinery wedged into a slice of land between them. 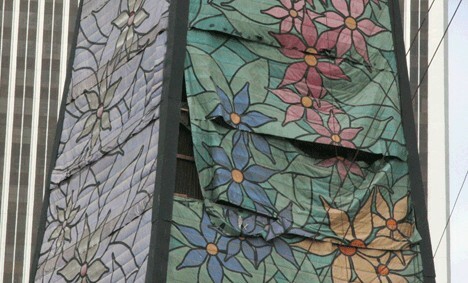 Camouflage can be approached in two different ways: either making an object blend into its background or altering the object’s appearance in such a way that it ends up looking different from what it actually is. 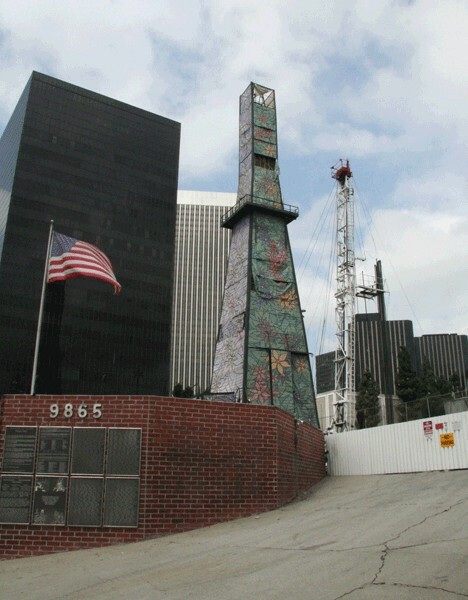 The owners of the BHHS oil well used BOTH of those strategies, one after another. The original covering of the well was a flat, pavement-hued gray that may have made the structure nondescript when looking down upon it. 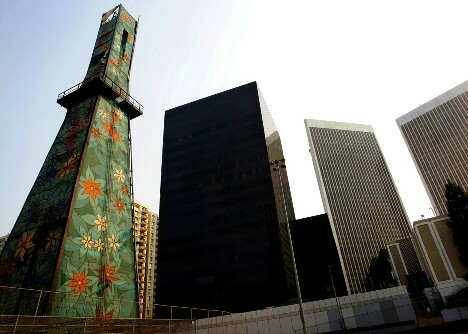 From any other angle, it either looked just plain ugly or at least, didn’t add any aesthetic charm to the area. 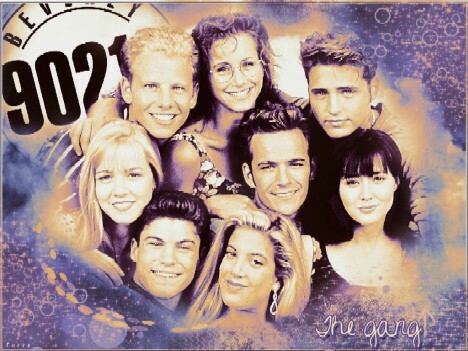 By the early 1990s, environmental awareness had begun to raise its head, and Venoco executives may have grown concerned by questions asked about the continuing viability of industrial activity in a human setting. 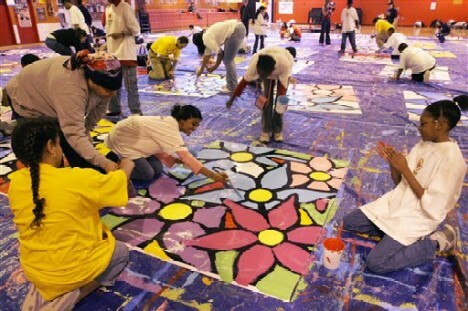 Enter Ed & Bernie Massey, the driving forces behind a creative therapy program known as “Portraits of Hope”. 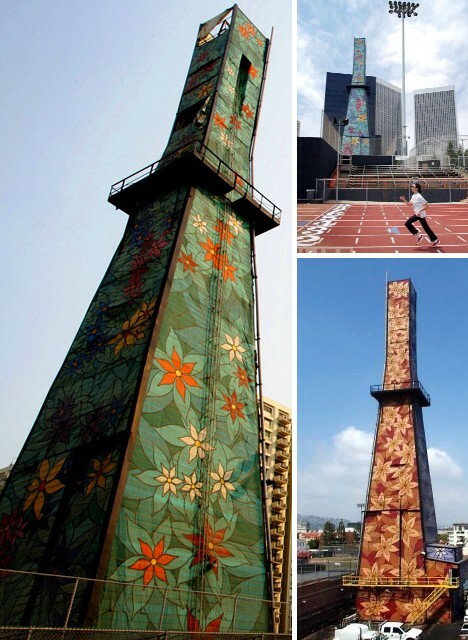 The Masseys instituted Project 9865, named for the oil well’s street address on Olympic Blvd., and worked with 3,000 terminally ill children from area hospitals who hand-painted industrial Herculite vinyl laminated fabric tiles which were then used to cover the matte gray tower. 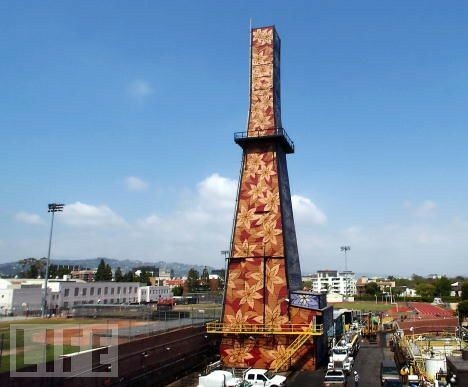 The contractor charged with installation, Eide Industries, used over 3 miles of sewing and 4,000 #2 spur grommets to securely fasten the painted “quilt”. 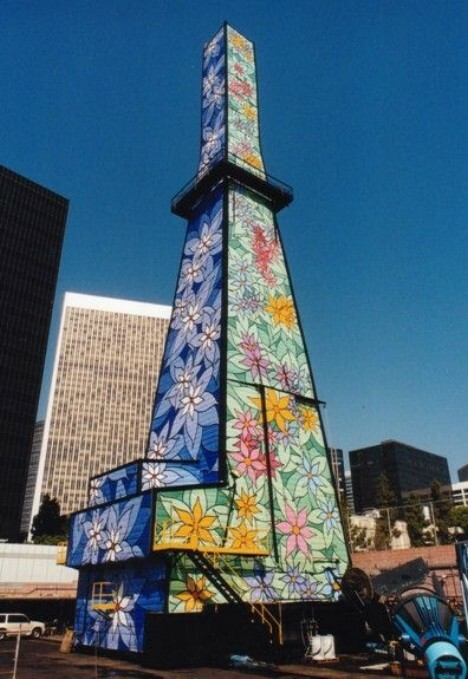 The so-called “Tower Of Hope” was unveiled at a ceremony in 2001. 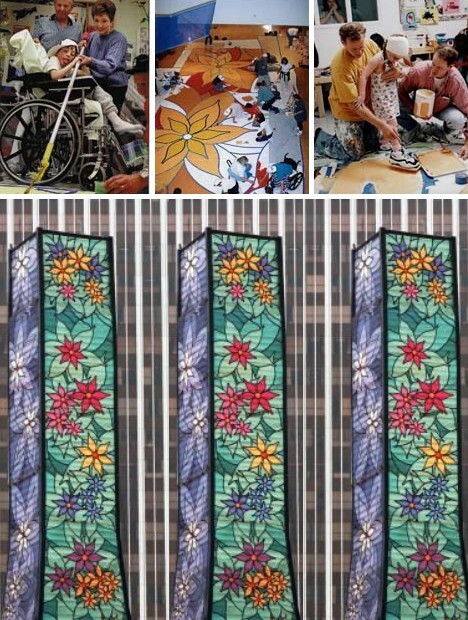 Where once was dreary gray, now bloom stylized flowers in an abstract design that depicts the four seasons across the tower’s four sides. Visually, it’s a definite improvement and Project 9865 also provides Venoco with a badly needed public relations boost: Big Oil does big good! More cynically, one wonders… who would want to tear down something so many terminally ill children worked so hard to create? Erin Brockovich, that’s who. The crusading attorney played by actress Julia Roberts filed a lawsuit against the local school district in early 2003. 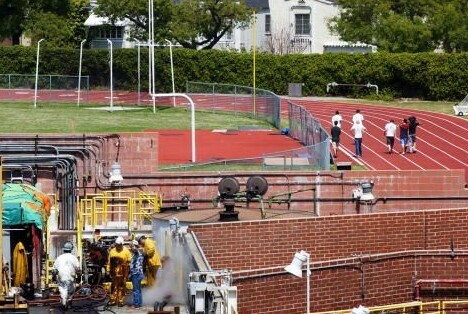 The suit accuses the City of Beverly Hills and three area oil companies of endangering the health of students at BHHS, which was compromised by carcinogenic toxic gases including benzene leaking from oil wells on school grounds. The media pounced on the story, dubbing the Tower of Hope the “Tower of Fear” and the “Tower of Hope You Don’t Get Cancer.” Over 1,000 plaintiffs are listed in Erin Brockovich‘s lawsuit yet the courts have yet to declare any link between Venoco’s operation at BHHS and an alleged cancer cluster caused by chronic emission of gases from the oil well. 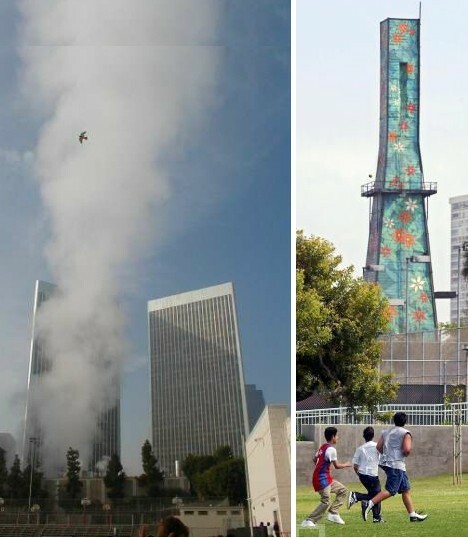 What does the future hold for Beverly Hills High School’s Tower of Hope? It’s hard to say – on the one hand, steady high oil prices supported by constant demand deem that the wells on school grounds continue operating. The courts may have the final say in the matter, however, as the lawsuit filed by Erin Brockovich slowly wends its way through California’s convoluted legal system towards an uncertain verdict. 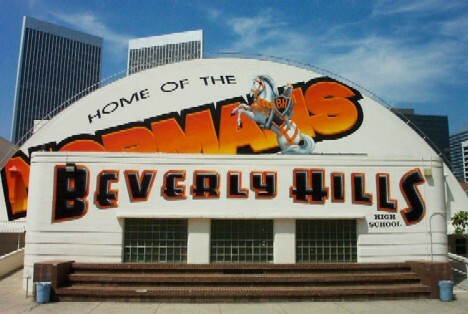 In the meantime, beneath the flowered walls of Beverly Hills High’s most controversial structure, the pumping goes on and the “black gold” that supports the school financially continues to flow.